When you look in the mirror and smile what do you see? Do you see black metal amalgam filling or visible metal on your dental crowns? Do you see embarrassing yellowed, crooked, gapped, chipped teeth or uneven gummy smile? You don’t have to live with either an unattractive smile or old and ugly dental restoration. A full-mouth rejuvenation can be used to not only rejuvenate your face, but also restore your old dental restoration, giving you a new, youthful, and healthy smile. If you are less than thrilled when you look in the mirror, we offer the options of smile rejuvenation cosmetic dentistry procedures and gentle treatments at Aria Dental of Mission Viejo. 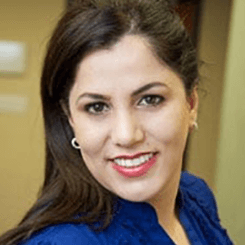 To find the best and most advanced treatment option to rejuvenate your smile, please schedule a consultation with Dr. Maryam Horiyat by calling (949) 364-9600 or of Mission Viejo. Why to Remove Silver (Amalgam) Restoration? Silver (amalgam) restorations contains 50% mercury in combination with other metal such as silver, tin, and copper. Mercury is a very powerful poison and if you have silver (amalgam) fillings or crowns, you are being poisoned by them every second of your life. Common activities such as chewing gum, eating, tooth brushing and tooth grinding can dramatically increase the release of mercury vapor, which will permeate in your cells and lead to atypical health conditions and even chronic disease, including a variety of nervous, digestive, and immune issues. Our patients are completely protected from any mercury exposure during the removal of their old silver mercury amalgam fillings. This is accomplished with the use of oxgent, mask, rubber dam and unique microseal technique... We offer Biological / Holistic Dentistry. To manage your smile, oral health, and overal health with holistic and biological denal care in Orange County, contact our office. When Should I Replace My Amalgam (Silver) Fillings with Composite (White) Fillings? Metal amalgam fillings turn black over time and looks very unattractive. Metal amalgam fillings increase temperature sensitivity in your teeth because they conduct heat and expand at a different rate than natural tooth structure. Metal amalgam fillings contain 48-55% mercury as the main ingredient. Mercury is known to be toxic and dangerous substance because mercury has the ability to permeate any cell in the body and cause atypical health conditions such as Lou Gehrig's Disease (ALS) and Alzheimer's Disease. Many patients who have had removed their mercury filling experience the dramatic restoration of health and vitality. 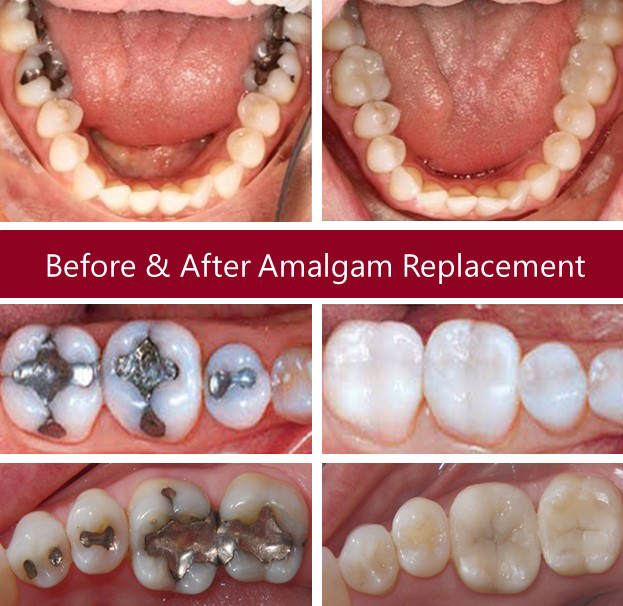 Thus, removal of metal amalgam is considered to be beneficial to you. We can replace your metal amalgam fillings with white composite options to give safer and overall healthier to your body as well as more attractive and comfortable smile. Many years ago, using metal in dental restoration was better options because the solid porcelain crowns were not strong enough to withstand your bite’s force. Later, porcelain fused to metal (PFM) crowns were introduced to dentistry to give an attractive crown with strength of metal. However, a dark metal is visible at the gum line, it tarnishes and changes the color of your gum to dark and retains plaque at your gum line. Today, because of the advancement in material science of solid porcelain crowns and Zirconium crowns, we can replace your metal crowns or PFM with solid porcelain. Sometime people get dental restoration that may not look pleasant or comfortable. Other times, dental restorations may look ok, but they get damaged or old over time. We can help to replace your old or unattractive restoration to give you younger, brighter, healthier, and whiter smile that you will be proud to show off on a daily basis.